The prius pack I'm looking at is made up of 38 modules, each consisting of 6 1.2v cells. Right. Here's the skinny. Each module weighs 1.04Kg. 38 modules x 1.04Kg = 39.52Kg. So, 88lbs, flexible configuration, 273.6 volts, 6.5Ah. The downside: They get hot during charging and require BMS. 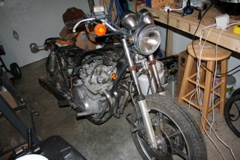 The upside: I'm building a motorcycle. Plenty of airflow avaliable.